Posted in Guaymas, San Carlos Attractions, Things to do with Kids, What to Do? There is nothing that makes a Scottish person more stubborn than telling them that something is impossible. With the last name of McLean, trust me I know! This was the case with Douglas McLaurin, co-owner of the Pearl Farm in Guaymas, Sonora, Mexico. While working on a class project during his studies in Biochemistry Engineering at Tec de Monterrey University in Guaymas, a teacher told him and his class partner that their idea to farm Sea of Cortez pearls was impossible. According to several Japanese texts on the subject, there was no way they would succeed and thus received a “C” grade on their project. However, living up to his Scottish heritage (provided by his grandfather), he became determined to prove them wrong…and that is just what he did! Today, Douglas and his partners have restored the “Cortez Pearl™” to its glory days, which were at a high point during the days of the Conquistadors in the early 1600’s. When the Spaniards first came to Sonora, they saw that the native Seri and Yaqui Indians had pearls. They eventually began trading with them and then started fishing for pearls themselves utilizing slave labor. The natives fought back and the Spaniards were forced to build the Presidio Pitic for defense. Pitic, an Indian name for “between two rivers” referring to the Sonora and San Miguel Rivers later became Hermosillo, the capital of the state of Sonora. By the late 1800’s, the Spaniards had exhausted the oyster beds in Kino Bay and Guaymas and moved to La Paz on the Baja Peninsula. In 1940, the Mexican government issued a complete ban on all pearl fisheries. In 1991, the University students in Guaymas started experimenting using local native stock: the “Rainbow Lipped Pearl Oyster” was selected for its incredible naturally-colored pearls. Douglas and his partners, Enrique Arizmendi and Manuel Nava, now have one square hectare with 200,000 oysters under cultivation in farming conditions. They are the only Pearl Farm in the world that is honored with a Full Product Integrity Rating from The Fair Trade Gem Federation. They have received this rating due to the fact that their pearls are not processed. They remove the pearls, rinse them in tap water and the process is complete. 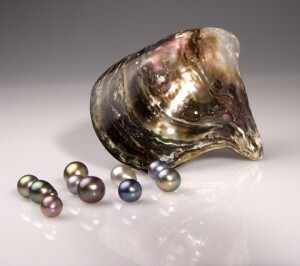 Most pearls from around the world are “embellished”, which can include bleaching, burning (in the case of black pearls), polishing, or applying lacquer. The Pearl Farm produces 8,000 pearls each year in two varieties. These pearls are unique in the world because of their color — or I should say — lack of distinct color. They come in all conceivable colors and unique combinations. The oysters produce an iridescent pearl and are considered the most valuable in the world. These oysters are under cultivation for four years instead of the usual two years and therefore the size is much larger. Because they sell pearls directly to customers without the use of a middleman, the prices are very reasonable for such high quality. They make their own jewelry and ship pearls to clients in India, Israel, France, Italy, Australia, New Zealand, and Canada. They also participate in the annual Tucson Gem Show in Arizona. The Guaymas Pearl Farm offers daily tours starting on the hour from 9:00am to 3:00pm Monday through Friday. They are open Saturday from 9:00am to 11:00am, however tours are not offered and they are closed on Sunday. The tour includes the visitor center (221-0136), which provides information on pearl cultivation and the history of pearl farming. They offer a lovely assortment of local handcrafted jewelry with these unique Sea of Cortez pearls. A souvenir from the Guaymas Pearl Farm will make a beautiful gift that is rich in history and a testament to a young man’s determination! ‹ In case of a medical emergency in Mexico, are you insured?